“We walk in the hope that we can move closer to the re-unification of Korea. We have always walked in the rain or shine. Let’s give power to women. Let’s walk.” – Young-Soo Han. 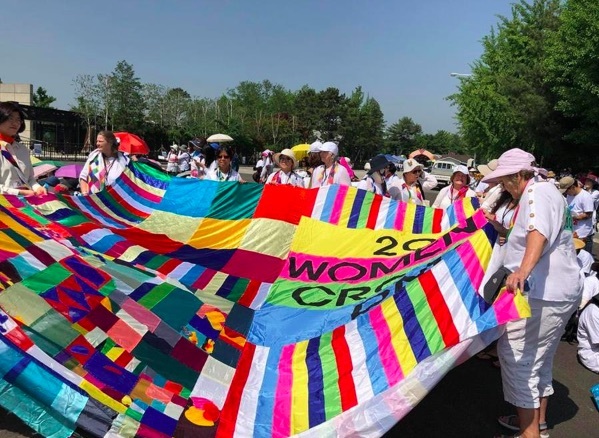 As the political situation on the Korean peninsula continues to shift, our #WomenPeaceKorea: A New Era delegation with Women Cross DMZ spent the day demonstrating for peace and women’s representation in the process. Our delegation of 30 women security experts and feminist peace activists from aroundthe world participated in the second historic DMZ Peace Walk today in Paju, South Korea. They marched alongside 1,200 South Korean women mobilizing for a peaceful resolution to the Korean conflict. Can Korea be reunified in peace? “This strip of land symbolizes the longest division of a people, and it feels so amazing to be walking with 1,200 women to erase this division.” – Christine Ahn. During the opening ceremonies we heard from Young-Soo Han, President of the National YWCA of Korea, about the significance of the march. The 5.5 km Peace Walk began by crossing the Tongildaegyo (Unification Bridge). As we walked we were told that this was the first time civilians had actually crossed the bridge on foot. The march came just hours before it was announced that, despite American President Donald Trump’s Thursday cancellation of June’s Korea peace summit, South Korean President Moon Jae-in met with North Korean Chairman Kim Jong-un on the North side of the DMZ to continue talks. “The time for peace has come. Peace can only come if the people build it. But peace also needs political leaders. So we call on Kim, Moon and Trump to sign a peace treaty for the people of Korea and for the world.” – Mairead Maguire. The Peace Walk ended in Dorasan Peace Park with a Women’s Peace Walk Declaration reading and Peace Festival. Nobel peace laureate, Mairead Maguire, also spoke at the festival to highlight the power of civilian peacebuilders and call world leaders back to the negotiating table.